High Impact Safety Banners for the industry improve employee safety. Unparalleled quality delivered fast. When you expect the best, we deliver!™ America's #1 Industrial Safety Banner designer and producer for 11 years in a row. We are located in Memphis, Tennessee. #1 provider of Safety Banners for the industrial workplace. Our high Impact workplace safety banners and safety posters improve facility safety. Unparalleled quality delivered fast. Safety Banners for American Industry and our American military. THAT IS OUR FOCUS! SafetyBanners.Org stormed onto the scene in early 2007. Today, SafetyBanners.Org designs, manufactures and ships more workplace safety banners to American industry and our United States Military than any other company in America. SafetyBanners.Org is the ONLY workplace safety banner company with a 100% satisfaction guarantee - no questions asked. Safety banners for the workplace have been around for over 50 years. Most of them were one or two colors, drab and consisted mostly of type proclaiming a safety slogan. In 2007 SafetyBanners.Org changed the industry in several ways. First: We used professional advertising designers to design high impact colorful eye catching banners. As they say in advertising, if you can't get their attention, nothing else counts. Second: We were able to sell them for considerably less while still maintaining the highest standard of quality and speed because there was no middleman. We sell direct to the end user. Third: We were able to offer a wide variety of sizes, from 2 foot by 4 foot up to 8 foot by 16 foot, in both horizontal and vertical formats. NO ONE had ever provided that range of choice before. We are not a one size fits all producer. Fourth: We offered free design capability to our customers so they could put their safety vision to work on a banner in their facility. This too had never been offered before SafetyBanners.Org came on the scene in 2007. Today, we have received permission from those customers for whom we did design work to sell their designs on our web site. Their safety vision combined with our design capability has produced some of the most popular banners on our web site. For example, 9 years ago item #1131 was a phrase one of our customers wanted on a banner. That was it. Black type on a white background. Nothing fancy. We came up with the design and they loved it. 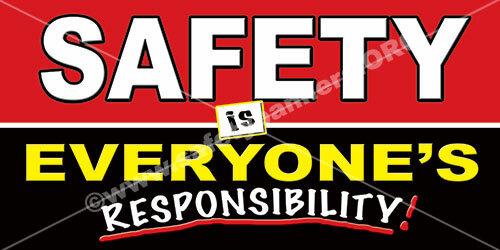 Today, it our most popular safety banner ever. We have sold over 5,700 of that one banner alone. Today, our vision is the same as it was in 2007. Focus on HIGH QUALITY products, professionally designed, delivered fast at a reasonable price with a 100% satisfaction guarantee, no questions asked. 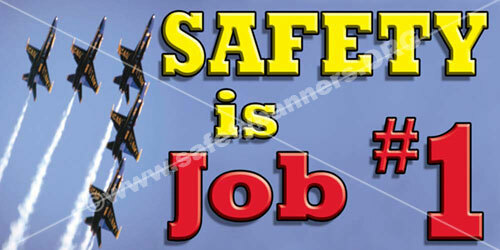 Our Very First Safety Banner Design - Safety is Job #1. 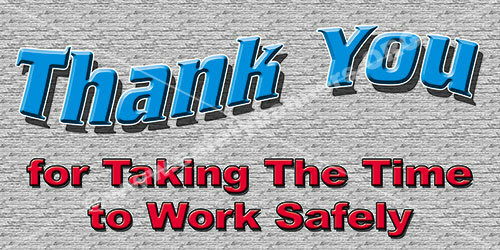 This workplace safety banner started SafetyBanners.Org in the safety banner business. safety banner. Our most popular safety banner ever. Over 5,700 sold. Designed by SafetyBanners.Org in 2007.